In India Honda Activa was the first product launched with CBS in 2009. Currently more than 2 crore* customers are riding confidently on their Honda CBS products, and doing so confidently! Equalizer is the brain of the system. Pressing the left lever activates the Equalizer, which distributes the braking force between the front and rear wheels simultaneously so that you can ride with the confidence of efficient braking in your hands. What is Combi Brake System? The most efficient way of braking is to apply the front and rear brakes simultaneously. But it is a practice, most two-wheeler riders have not mastered. 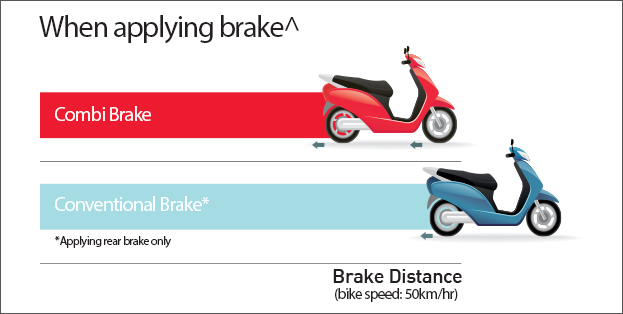 The Combi Brake System in Honda two-wheelers enables you to use both brakes with just a lever^. It reduces the braking distance and improves stability while braking. Honda Combi Brake with Equaliser, ensures distribution of Force between the Front and Rear Wheel at the same time, giving perfect balance to the rider. It ensures that rider with low expertise is also confident while braking. Simultaneous application of Front and Rear Brake leads to the most effective braking. Here you can participate in CBS with Equalizer – Test Yourself Quiz. You need to select the most appropriate answer from the given options. Submit your entry with personal details. Question : What does CBS mean? Question : How many products of Honda 2 wheelers are CBS enabled in India? Question : What is the role of equalizer in CBS? Question : What is the benefit of CBS with equalizer in Honda 2 wheelers? Question : How many riders trust the equalizer technology of Honda’s Combi Brake System? Question : Honda 2 Wheelers was first in India to introduce CBS technology 10 years back in 2009? You have already tested your self. Stay tuned for further details. Disclaimer : Actual braking distance may vary due to riding condition and speed of the vehicle. Accessories shown in the picture are not part of the standard equipment. Map not as per scale and only reference.